My next pedal... The Wampler Psychosomatic Drive! Tivo does not support the Mac, so iTivo was the only option. It turns out that iTivo works better than Tivo's Windows software. Now I can watch "Jeff Beck: Live at Ronnie Scott's" in my office on my new iMac i7 while I get some work done. Nothing like multi-tasking. 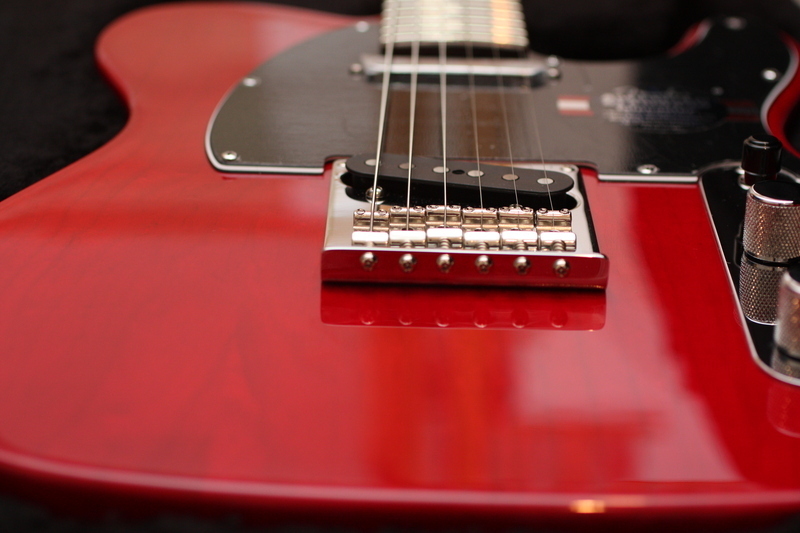 The Red Tele Is Done! Well actually it's been done for weeks, but this the first I've had a chance to take some pictures to post. As you recall I picked up an American Standard Telecaster to be my FrankenTele.... I lucked out and found a beautiful one that played and sounded great. I almost didn't want to toy with it, but I did. You can see my short troubles with the first whammy bar here. You can see the work order to my tech for all the requested mods here. I did have a little trouble at first. The P90 magnetics were not aligned the same as my Tele so there was nasty phase cancellation. Lollar modified a set of P90's so that they would the rest of the pickups in my Tele and it sounds great. So here are the pictures of the finished FrankenTele. I took it with me to my labor day gig and couldn't be happier with how it played and sounded. I'm really loving the Bigsby B5. If your wondering about the weird bar attached to the Bigsby, it's a Chet Atkins Bigsby arm that I swapped in from Guitar Parts Resource. The stock arm fell right across my volume and tone knobs. I found that when I installed the Chet Atkins bar and reversed the "kink" in it up instead of down, how Chet used it, the new bar felt comfortable and fell in a perfect spot. Enjoy the pictures... Hopefully I'll get some time in the future to post some sound samples of the P90 in this configuration. 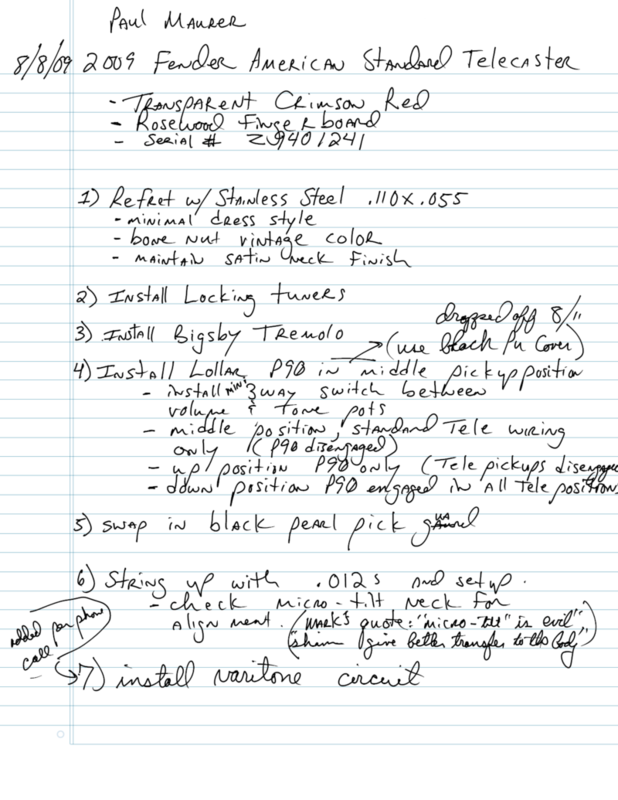 Before I dropped it off, I'd thought I would try and figure out if the switching configuration was "do-able" and spent a while scribbling out some options (see below). Can you tell if any of them worked? Can you even decipher my hieroglyphics? Yes, I eventually gave up and just asked him... He just looked at me and said "It's simple, no problem". Lesson learned, always talk to your tech first. Yep, I'm thinning the herd. My first "good" amp was a Musicman RD112 100 watt amp with an EV speaker. Musicman stopped making amps shortly after that. I purchased the amp from Nolde's Music Box in Flemington NJ back in 82 or 83. Nolde's is no longer there, but I still have that amp today. The amp has an incredible clean sound and a good distortion channel. These amps were supposed to be Leo Fender's redesign of his original fender amps when he founded Musicman. 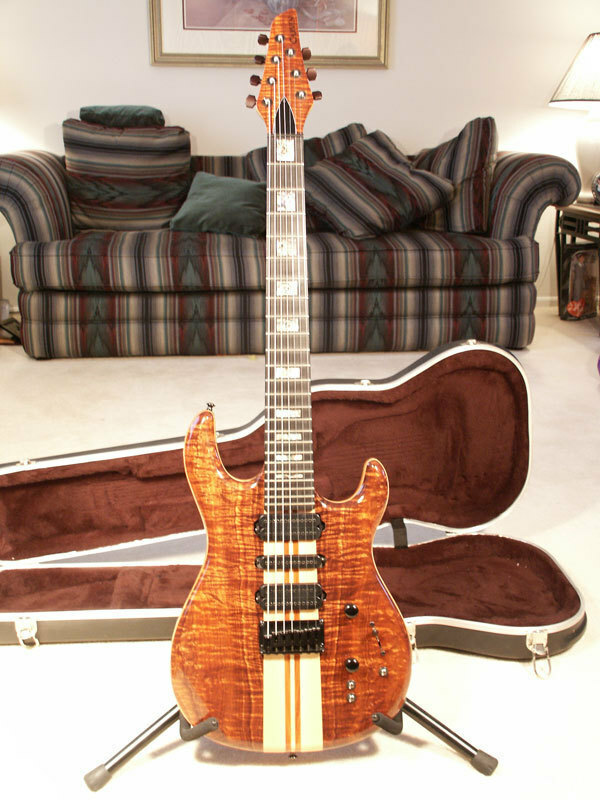 In reality Leo focused on guitar design while at Musicman, before leaving to start G&L. I liked the amp so much that I collected a few fixer uppers off eBay over the years. Before I knew it I had four in my gear "closet". (Did I mention I have a beautiful, loving and understanding wife:) Up until a few years ago these were my main gigging amps. 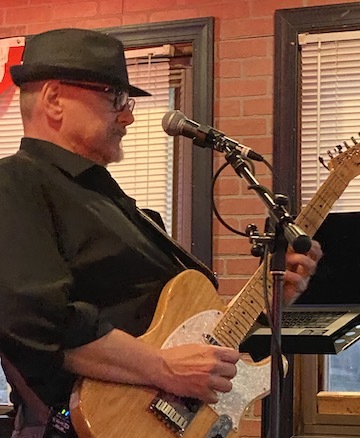 Playing in a cover band I became frustrated in the natural trade offs required in a two channel amp with a single tone section. You can get great clean or distorted sounds, but not both. 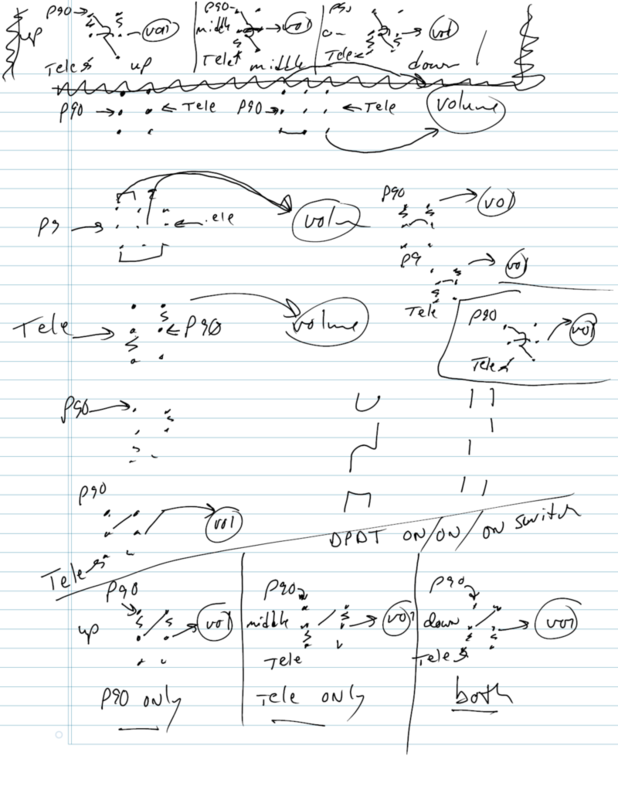 So dialing tone between the two channels is a "zero sum" game. Now I lug around a Mesa Engineering Nomad 100. (Sigh... Yes, they don't make those any more either.) The Nomad was one of the first Boogies with fully independent channels and it gave me all the versatility I needed to play the variety of music I like. Back to the three "friends" I am parting with... First there is the RD112/65. It has a single 12" musicman speaker and runs at 65 watts. This amp sounds good and is, by far, the lightest of the bunch. Next there is the RD210/100, 2 10" musicman speakers at 100 watts. Surprisingly, it has the most bottom end of the three. Finally there is the RD112/100 that is supposed to be identical to the original I am keeping. For some reason, this amp is voiced differently. The distortion channel has more mid range and the highs and lows are rolled off slightly. I suspect this was an attempt in later models to fix the trade-offs I mentioned earlier, but that makes assumptions about the tone curve your looking for in your distortion. So with the expense of my current project and the fact that these babys are gathering dust (and deserve better), I've put them on consignment at the Music Box in Hamilton NJ. The salesman was professional, polite and managed to not totally glaze over as I recounted all of the above. They do a lot of consignment there so I guess they're used to the "old equipment" stories from middle aged guys like me. So if you are interested in old musicman amps, give the Music Box a call. Great timing.... from GuitarPlayer ☛ "All About … Whammy Bars"
"GUITARISTS TEND TO COME IN THREE SCHOOLS AS far as vibrato tailpieces, or “whammy bars,” are concerned: those who can’t live without them, those who can’t live with them, and those who tolerate them on their guitars, but rarely touch them—either for reasons of style, or for fear of spiraling out of tune. Love ’em or loathe ’em, vibrato tailpieces do change the sound of any guitar they’re mounted on, even when they’re not in use. If you do actually want to use one, however, and thereby indulge in the world of manual pitch-bend effects these ingenious contraptions can offer, it pays to know something about the form and function of the different types of vibrato systems that are available"
What's next? Low Riding Marshals! ☛ "Color Changing LED's on a Guitar Amp..."
1) you need to install a shim under the neck. Granted it only raises the neck about 1/8" up, but it also increases the angle off the guitar. I followed directions to the tee drilling all the proper holes in the shim and reset the neck. After I replaced the bridge with the Stetsbar unit, I had to raise the new bridge so high I questioned why I would even need the shim. But I continued to setup per the instructions. When done, the whammy bar barely had an inch of play. Also, the guitar sounded very thin. I attributed this to the fact that the bridge was as high as a NJ Tutnpike overpass. 2) next I decided to pull out the shim from the neck and use the fender patented micro-tilt neck adjustment to align the neck with the stets bar. I was able to setup the guitar with great action and it sounded much better. One problem though, no matter how I adjusted the stetsbar, the whammy was full flat against the body with no play. Basically looked like the stetsbar springs could not compensate for my heavy strings. 3) so I decided to bite the bullet and switch to a normal set of . 010's which the Stersbar should handle without problem. No dice. Same problem as before. 1AM last night I cried "Uncle"! This morning I'm going to restore my Telecaster to it's original condition. Tomorrow I'll call the manufacturer with some hard questions. I guess this is why having a good tech do all your work is worth the money. They can deal with all the headaches and aggravation. I've moved from Les Paul's to Semi-hollow body guitars (Johnny Smith and Carvin) to pointed headed super strats (Hair Metal Red Guild Aviator), custom 7 strings and finally ended up with Fenders I first fell in love with a Strat and eventually a Tele. The Telecaster was such a simple and straight forward guitar, but had a sound that just grabbed me. Even though I'm a basic "classic rocker" the twang of the Tele is magnetic, and even lends an interesting flavor in a straight ahead rock environment. Needless to say the Tele has been my main guitar for years... but every once in a while I want to try something different and move to other guitars to try new things. 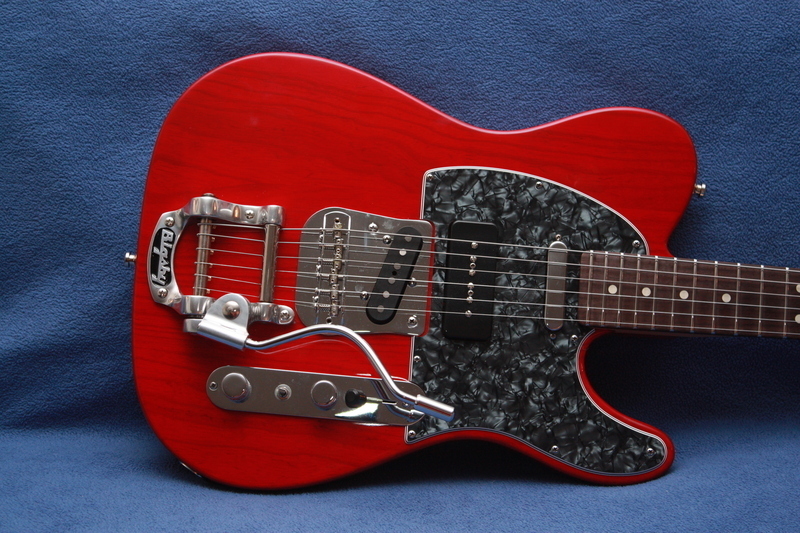 I've finally decided to pickup another Tele to use as an experimentation guitar. That new Telecaster (Transparent Crimson Red American Standard) is the one pictured here. I wanted to take a few pictures before I started to dig in. I'm going to add Schaller strap locks, locking tuners and a Stetsbar whammy bar. 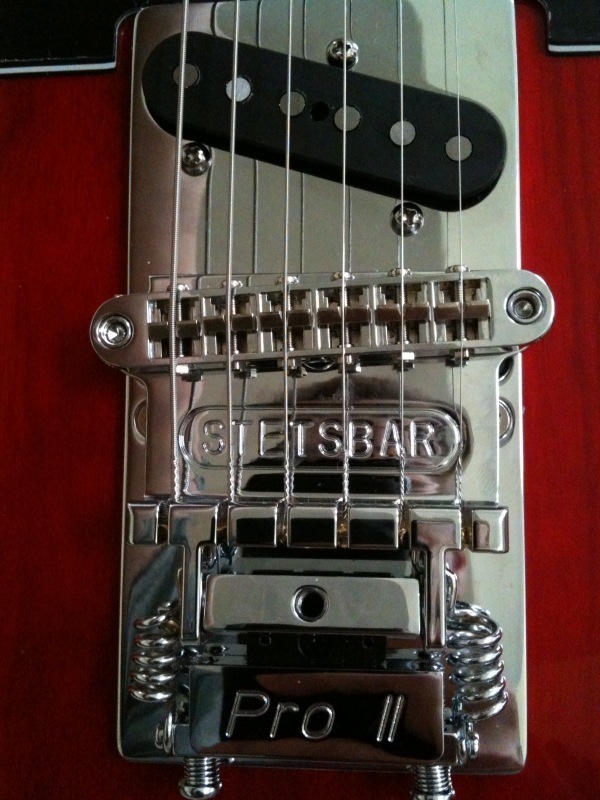 [Note 08/08/2009: I've opted to go with a Bigsby B5 for the Telecaster. You can purchase springs of various tension, which will support my heavy strings (.012's).] Then I'll take it over to The Music Box and have their tech (Mark Wybieralla) refret the guitar with jumbo stainless steel frets. I use heavy strings and the stainless steel jumbos make bending tolerable. Mark does great fret work. Finally I'm going to go with a modified Nashville configuration by adding a P90 as a middle pickup. I haven't decided exactly how I'm going to wire this up, and routing out the guitar cavity is scary so I'll probably noodle this for awhile before I pull the trigger.